Each image offers up a world. 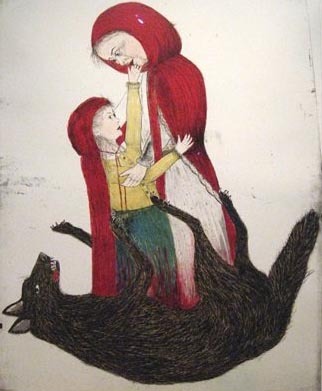 Kiki Smith depicts the grandmother and Little Red Riding Hood as emerging from the body of the wolf. Women have often been associated with animals, the material and sensuous (wild, non-rational) nature. The red of the cape emerges out of the blood of the wolf: death, life–the bleeding that women experience and that terrifies the male psyche. From Crane’s traditional portrait of the girl meeting the wolf we recognize the wolf as male- as threatening to the girl. He wears the veneer of civilization in his clothing but the tail, sharp teeth, and lolling tongue betray his lustful and destructive nature. As Egan guides us we recognize the big binary ideas of male/female, human/animal, death/life, safety/danger. Young children grasp the import of these stories as far broader and deeper than simply amusing tales of long ago and far away. 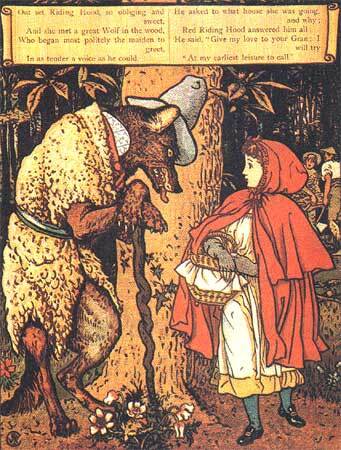 For one more fascinating rethinking of the Little Red Riding Hood story, check out this video. I thank the Blogger on Dog Art for finding this creative revisiting.